A bit of a killer hole for cyclists on Clifton Down. I reported it to Bristol Council when I got home and it was filled by the end of the next day. It's a shame that the inefficient central government forces its budgetary problems down to local authorities, who in general are much more effective and efficient. 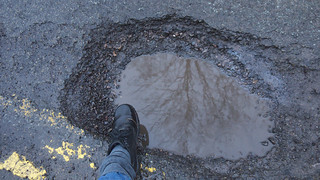 Properly funded and well-managed maintenance would stop holes like this appearing in the first place.